Blackinton B1450 Eagle Badge with Circular Panel - B1450 - 2 3/4" x 1 7/8"
Home > Blackinton > Police Badges > Badges with Eagles > B1450 Eagle Badge with Circular Panel - B1450 - 2 3/4" x 1 7/8"
B1450 Eagle Badge with Circular Panel - B1450 - 2 3/4" x 1 7/8"
Impress the department with this patriotic badge from Blackinton. An eagle, wings spread to its fullest with intricate feathering detail, is featured atop the B1450 circular panel. The shield offers three fields for lettering and provides ample space for a personalized, full-size, central seal. The badge's dimensions are 2 3/4" x 1 7/8". Trust the Blackinton name. A brand identified by their expert craftsmanship that has made them a leader in badge manufacturing since 1852. The item is manufactured in the U.S.A. Allow four to six weeks for customization and delivery. 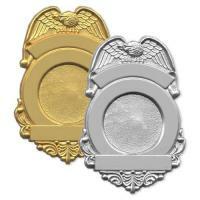 Dimensions: 2 3/4" x 1 7/8"
©2002-2019 CopsPlus.com: Blackinton B1450 Eagle Badge with Circular Panel - B1450 - 2 3/4" x 1 7/8"